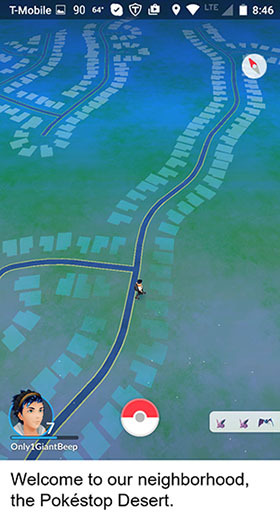 The summer of Pokémon Go is in full swing, which you already know unless you’ve been living in a cave for the past two weeks. Scratch that – unless you’ve been lying unconscious in a cave, because otherwise you would’ve noticed hordes of people standing around tapping their smartphones in front of your cave. What is this Pokémon Go anyway? The concept is incredibly simple: Collect Pokéballs; catch Pokémon by throwing said Pokéballs at them; then have your Pokémon fight other players’ Pokémon to see who’s stronger. That’s great, you’re thinking – but how is a mobile game that is essentially the same thing as cockfighting relevant to brick-and-mortar commerce, or for that matter, to the real world at all? Well, because it brilliantly uses real-world tie-ins to draw people to real-world locations. And in doing so, it’s stumbled upon the Holy Grail of mobile marketing: a dual-threat enticement that is neither advertising nor e-commerce, and lets the online and physical channels work together rather than against one another.